The income tax calculator on the website of the Income Tax Department is one of the most widely used online utilities in India. It looks as though the calculator is making a mistake with regard to the set off of loss from house property against salary income. The mistake is as on 16-Jan-2018. You may be aware that in FY 2017-18 the government introduced a limit on the loss from house property which can be set-off against amounts under other heads of income. See here for more information. In case the loss from house property is more than Rs 2 lakh, the set off is to be restricted to Rs 2 lakh. In other words, the loss from house property amount beyond Rs 2 lakh should be ignored and cannot be used for set off in the year. The income tax calculator on the Income Tax Department site considers the entire loss (from house property) amount for set off even when the loss is in excess of Rs 2 lakh. We entered some dummy data on the tax calculator to check. 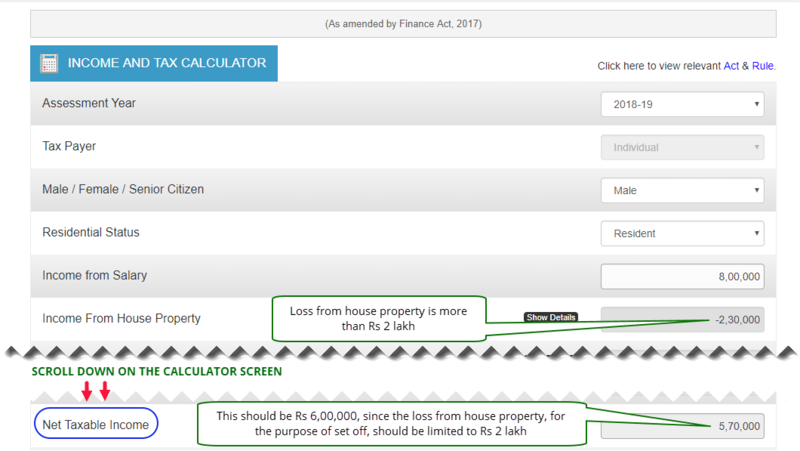 As you can see on the above screenshot, the calculator considers the entire loss (from house property) amount for set off even when the loss is in excess of Rs 2 lakh. Given that we are in the last quarter of the tax year, we request the Income Tax Department to rectify this error at the earliest.